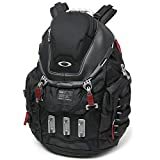 The Kitchen Sink Backpack brought to you by Oakley is big enough to carry everything but, well, you know. 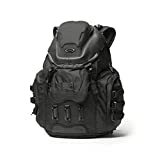 The backpack has a unique style -- ruggedly cool with an almost futuristic look to it. It can fit up to a 17" laptop, if you're that serious about size, and an abrasion-resistant fabric keeps your goods protected. Available in black, stealth black, red, and white, you can choose how much of a statement you want to make while getting stuff done.